The biggest question of all when it comes to boondocking is “where?” Your best bet to is pursue public land, usually through the Forest Service or BLM. Dispersed camping on these lands are typically permitted but always double check before setting up camp. Take the term “boondocking” seriously as a rule of thumb, and if you are nearby any campsites or developed areas, give yourself a little more space and go out into the boonies. To be proactive in your boondocking search, you can check out Boondockers Welcome for a directory of camping spots. If you’re looking for a quick stay in the city and need some free dry camping, certain retailers such as Wal-Mart, casinos, and travel centers may be the place for you. “Wild Camping” or dispersed camping is permissible for a period of no more than 14 days. When boondocking, adopt the Leave No Trace philosophy and select sites that have already been camped in. Look for evidence of a former site such as campfire rings and set up shop there. Be respectful to the wild land and camp on bare soil if possible, staying away from plants and landscaping. Pack out all trash. While this should be a staple for wherever you camp, packing out all trash from your boondocking site is vital. Observe fire restrictions. If fire danger in the specific area is high that day or you have any cause for concern, just keep cozy in your RV and say no to a campfire. Make sure you are parked a safe distance from the road. Now, you don’t need to be miles in, but do give yourself some space. Before setting off on your wild camping adventure, make sure you have enough water to last you! Fill up your water tanks as much as possible and also keep enough potable water for your needs. Even picking up an extra multi gallon jug for potable water could be worth it. Being mindful of your water usage while dry camping is key: never leave any faucets running, minimize your water use while flushing, and even turn off the shower while soaping up if you’re open to it. 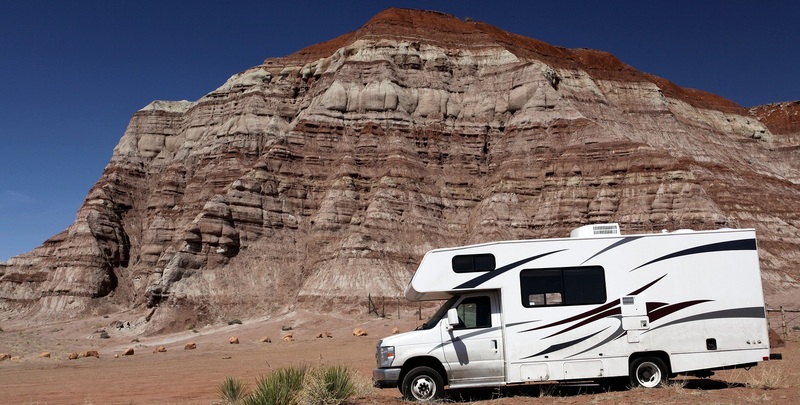 Check out these RV water conservation tips from Wheeling It. Bring down electricity usage by implementing a few simple tactics: use lanterns or flashlights for light, remember to turn the pump switch off when not in use, unplug as many appliances as possible, and keep your windows open for natural air flow. Well there you have it! We hope you enjoyed our quick crash course into the world of boondocking and that you can set off on your own dry camping adventures. Have any tips for first-time dry campers? Leave your advice in our comments below.